Piyush has travelled to Quebec from India, where his interest in sustainability began at a young age. He would frequently visit national parks and bio reserves that had endangered species, such as tigers, rhinos, and leopards. He was drawn to his Globalink project because Atlantic salmon are already considered endangered in parts of Canada and the United States. 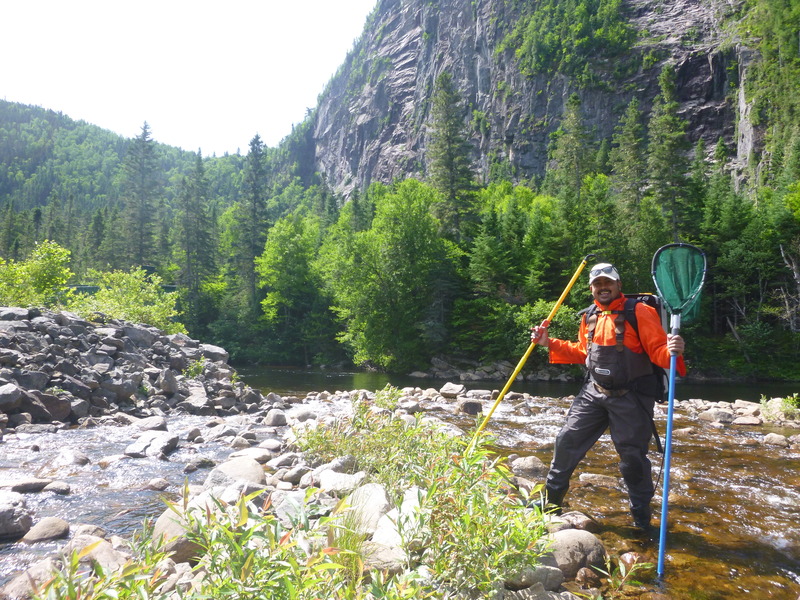 During his 12-week internship, Piyush is spending time between two research stations: one at Université INRS in Quebec City another — about three hours northeast — in the wilderness near the city of Sacré-Coeur, where he is tagging Atlantic salmon with sensors to study their passage through a variety of culverts. These tunnels can be different sizes, shapes, and made from various materials. When culverts are poorly installed or maintained, they can become barriers to fish passage for various reasons, such as high water flow velocity and a lack of refuge in their path. After several 48-hour trials, Piyush will collect data on how many tagged salmon swam through the culvert versus how many salmon did not leave a cage installed at the downstream end of the culvert. At the end of his internship, he will provide measurements to predict if a culvert is passable or not. When he’s not in the wilderness, Piyush is exploring the sights and sounds of Quebec City and befriending the many locals who have shown him all that the city has to offer. Piyush says the internship has provided him with a full experience. Mitacs thanks the Government of Canada and the Government of Quebec for their support of the Globalink Research Internship program in this story. Across Canada, the Globalink program also receives support from Alberta Innovates, the Government of British Columbia, the Government of New Brunswick, the Government of Newfoundland and Labrador, the Government of Nova Scotia, the Government of Ontario, the Government of Prince Edward Island, the Government of Saskatchewan, and Research Manitoba.